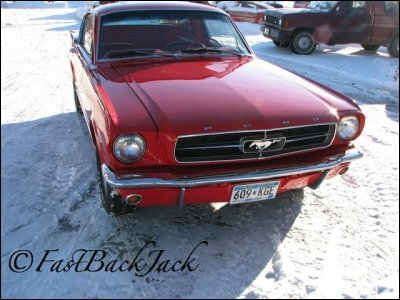 1965 Mustang 2+2 Fastback SOLD!!! Original Rangoon Red with red interior restored driver! 65 Mustang fastback roof SOLD!!! great for a coupe to fastback conversion! Comes with roof weatherstrip channels and trunk hinge. 1965 Ford Mustang Fastback A code 4 speed project SOLD!!! Car has a 289 2 bbl with a 4 speed transmission. 1965 Mustang Fastback roof donor SOLD!!! 1965 Mustang Coupe rolling Shell SOLD!!! Rust Free Nevada Car. Would make an excellent donor car for Fastback or Convertible Conversion! 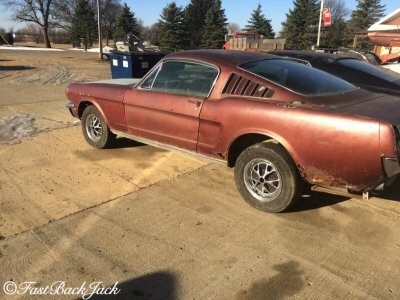 1965 Mustang Fastback 2+2 Project SOLD!!! Pretty solid car with some rust and body damage. 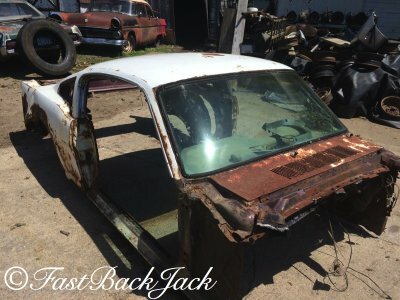 Hard to find Project. Comes with parts you see and Bill of Sale Other parts available for additional cost. 1965 Mustang Fastback Donor SOLD!!! 1965 Mustang Fastback roof Donor. Was a V-8 car. What you see is what you get. 1965 Ford Mustang Fastback - SOLD!!! 2+2 A code 289 4 bbl. with 3 Speed. Runs and drives excellent! Power Steering , Disk Brakes, and Air Conditioning with Magnum 500 wheels. 1965 Mustang Convertible Project or parts Car SOLD!!! 6 cylinder 3 speed Clean Title! 1965 A code 289 SOLD!!! with 4 speed and Disc Brakes. Complete car selling parts. Contact with needs. Copyright ©2008-2018 All photos and images on this website are the property of FastBackJack.